Mrs. Platzer's Art students took Pablo Picasso's cubism to the next level, painting vibrant and unique cubes of "Picasso Faces" using discarded computer boxes. Working together on the cubes, students drew upon the inspiration of Picasso's cubist period, creating their own 'Picasso Face' to share with all. Vincent Van Gogh is known for his contrasting colors and his impasto style filled with hatch strokes and rolling, pulsing motions of his paintbrush. Van Gogh would stroke his paint on the canvas with a knife, or brush - almost like working with clay - the paint strokes forming marks with textures. One of his most famous paintings in his 'Sunflowers'. Students grew a field of sunflowers to place in their vision of Van Gogh's 'Sunflowers'. 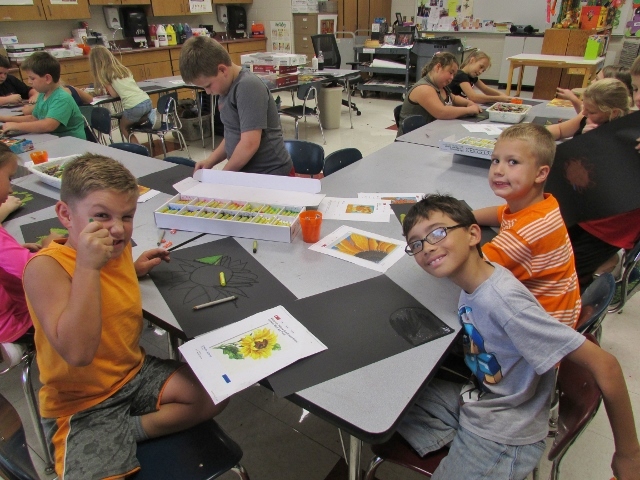 Third graders use their talents and creativity drawing their sunflowers.